We had our 2nd Annual Senior Snow Ball on Thursday and it was an amazing evening. We bussed in hundreds of seniors from all over CD14 – from Eagle Rock and Highland Park, to Boyle Heights and El Sereno. A big thanks to the L.A. Presbyterian Church for hosting our dance once again. This is truly a special event, where we get to honor our Seniors for all they’ve done for us this and every year. When you think of all the sacrifices they have made to make our lives better, hosting a dinner and dance is the least we could do for them. We had great food, a great band (Chico – they’re incredible – they can play everything from Swing to Salsa), and most importantly, a great group of Seniors from about 20 senior clubs and organizations throughout CD14. 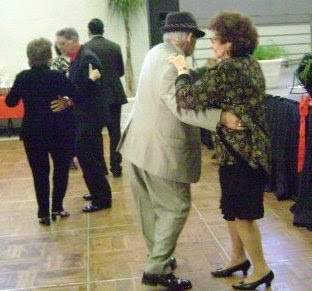 Our Seniors were all dressed up and ready to dance, which they did plenty of. Growing up, I remember my grandparents, they didn’t care if I was “naughty or nice,” they loved me unconditionally and I’ll never forget that. And so it’s very important to me to honor these special people, who often don’t get the credit they deserve in the hustle and bustle of every day life. A big thanks to my staff for keeping high spirits and ending our month-long holiday calendar of events on such a high note. I appreciate it and I know our Seniors certainly do too. Esmeralda Bermudez from the Los Angeles Times wrote a wonderful story about a group of Senior ladies from El Sereno who came to our event. Lastly if you’re lucky enough to have a Senior in your life this holiday season, don’t forget to give them a big hug and thank them for all they’ve done.